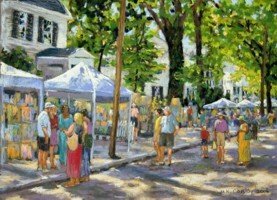 Dorchester Center for the Arts presents the 42nd Annual Dorchester Center for the Arts Showcase, a free outdoor street festival on historic High Street in Cambridge, MD on Sunday, September 22. This signature event is designed to celebrate and foster an appreciation of the arts in Dorchester and surrounding communities, and to showcase the area as a prime cultural destination. From noon to 5 pm, visitors can enjoy more than 75 artist and artisan booths featuring painting, sculpture, mixed media, ceramics, fiber art, jewelry, photography, and woodworking. Heritage arts such as blacksmithing and model work boat building will be featured as well. Throughout the afternoon there will be live music, theater and dance performances, and interactive art projects for all ages. Not to mention plenty of food including traditional Eastern Shore cuisine. Long Wharf Park will include the skipjack Nathan of Dorchester exhibit and free skipjack rides at 1pm, 2pm, and 3pm. First come, first served. For more information, call 410-228-7782.